Amazon.com description: Product Description: Argues that a good education and a secure job are not guarantees for financial success, and describes guidelines for making money work for you. from Doubleday (June 1, 1999); titled "Rich Dad Poor Dad: What the Rich Teach Their Kids About Money - That the Poor and the Middle Class Do Not!" About: A self-made millionaire and financial expert argues that a good education and a secure job are not guarantees for financial success and describes six proven guidelines for making money work for you, in a new edition of a self-published best-seller. from Grand Central Pub (September 1, 2001); titled "Rich Dad Poor Dad: What the Rich Teach Their Kids About Money - That the Poor and the Middle Class Do Not!" from Grand Central Pub (May 1, 2000); titled "Rich Dad Poor Dad: What the Rich Teach Their Kids About Money - That the Poor and the Middle Class Do Not!" About: Argues that a good education and a secure job are not guarantees for financial success, and describes six guidelines for making money work for you. With Robert T. Kiyosaki | from Varsitybooks.Com (April 1, 2000); titled "Rich Dad Poor Dad: What the Rich Teach Their Kids About Money - That the Poor and the Middle Class Do Not!" 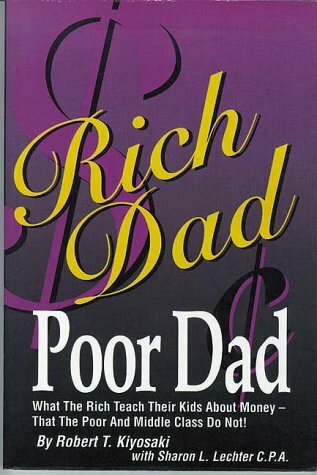 This edition also contains Rich Dad Poor Dad: What the Rich Teach Their Kids About Money - That the Poor and the Middle Class Do Not! from Techpr Inc (March 1, 1999); titled "Rich Dad Poor Dad: What the Rich Teach Their Kids About Money - That the Poor and the Middle Class Do Not!"